Dr. Mary Ellen Hoye provides quality general dentistry, endodontics, periodontics, and orthodontics for patients in Homer Glen and nearby communities. With the help of our highly-skilled specialists, our dental practice can serve all your oral health needs conveniently, in one location. "I’ve been bringing my family to Dr. Hoye for 7 yrs now I believe and it’s slways a pleasant experience. I personally had a traumatic dental experience as a child so it was important for my children to understand the importance of taking care of your teeth. The staff and dental hygienists are amazing; they make it a fun experience for lil kids. I highly recommend Dr Hoye and her amazing staff!" ~Amy R.
This welcome visit is when you meet Dr. Hoye and our dedicated team. We value your time and don’t keep you waiting. Once your paperwork is finished, you will be seen promptly. Forms are also available on our Patient Portal. Advanced Imaging - Dr. Hoye carefully reviews your x-rays to detect decay, bone loss, and other crucial health-related conditions, including oral cancer. Gum Health Evaluation – An in-depth periodontal check-up is performed to identify any signs of gum disease. Complete Dental Examination - All tooth surfaces are inspected for cavities and the look and function of existing restorations are also assessed. Professional Dental Cleaning – Plaque that has turned into tartar is gently and efficiently removed. Teeth that do not receive regular cleanings are at substantial risk for deep decay that can turn a small cavity into a dental emergency. This hardened material also significantly increases your chances of developing progressive gum disease. Everyone at our dental office works hard to provide a positive and satisfying experience. Our experienced and gentle hygienist, Dr. Hoye, and our specialists prioritize your comfort during treatments and have all built a reputation for exceeding expectations. We offer many amenities including free Wi-Fi, blankets, and pillows. When it comes to procedures to enhance your smile or restore function, you can rely on our dental professionals to maximize your investment. By offering some of the most affordable services in Homer Glen, our dental office has helped our patients maintain their oral health and enjoy an ideal smile. Our staff is standing by to answer your questions. We offer flexible appointment times and can help you navigate your insurance benefits and payment options. 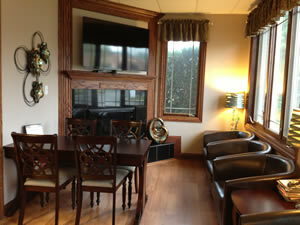 We welcome you to visit our cozy and relaxing office to see the difference for yourself. For detailed information on our general dentist and specialists, visit our Meet the Doctors page.